Package labeling. It is the key to drawing attention to a product, to reduce interest in other similar products, and to make someone buy a specific product. Let’s be honest. Not everything printed on a label necessarily provides ALL the information. Use certain words and an “implied” thought will occur. The intended meaning of 100% natural implies that it has not been touched by human hands. As such, with wood, this would refer to the fact that a tree is a plant designed by nature and other than cutting the tree down, it is not modified in any way. However, we do know that trees, like flowers, can be manipulated when it comes to their genetics. Genetically modified trees are quite common in the growth of orchard woods, especially those seeking to develop dwarf varieties or specific blossom colors or hybrids. Keep in mind, genetically modified trees will have a reduction in the lignin compound which is responsible for the flavor the wood gives when it burns and gives off smoke vapor. Currently, it is not legal to genetically modify forest trees but there is a lot of allowances when it comes to plantation and orchard/nursery trees, which often have chemicals applied to make up for the weak lignin which makes the wood susceptible to decay and pest infestation. Wood that is dried in a closed chamber in which the temperature and relative humidity of the circulated air can be controlled is called “kiln drying”. 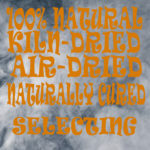 There are three types of Kiln Drying methods: low-temperature drying which is below 130° F, conventional electric dehumidification drying, and conventional steam-heated drying which have temperatures up to 180° F.
For the most part, when a smoking or grilling wood product lists “kiln-dried” on the packaging, it does not state the type of method being employed. Also, many that use this term do so without providing any information on what compliance record keeping is in place to attest that they are doing what they say. There is one company who states that they adhere to the protocol designed by the United States Department of Agriculture (USDA) but quote a core temperature and length in minutes of the heating process that is not the standard written by the USDA. Their compliance agreement is provided by the state in which the business is located, which may have a different standard in place than the USDA. The process of drying green wood by exposure to prevailing natural atmospheric conditions outdoors or in an unheated shed is known as air drying. There are three dominate Air Drying methods: open yard, shed, and forced-air shed. The first is not held in high regard as the wood is exposed to all the elements making it the longest method of depleting moisture content from the wood. The second has the addition of a roof covering to maintain a precipitation-free environment, while the third option is mostly used by traditional lumber companies as it produces quicker results meaning products can be sold quicker. Here’s the issue when you see “Air-Dried” on package labeling of grilling and smoking woods: you don’t know what method is used and no one is saying how long the wood was air-dried for. You don’t know how old the wood is, what method of air drying was employed, how long it took to “dry” it, and you likely won’t know what moisture content is left in the wood. Remember, dry out a piece of wood too far, and it is simply firewood designed for heat output only. This is another term that floats out on the packaging that implies it is different from air drying techniques. It is not different. Naturally curing wood means the wood is stacked in a manner that allows air to flow around the wood pieces usually in an outdoor setting. It may be left exposed, covered with a tarp or have a roof structure overhead. Naturally curing wood for fireplace use is recommend for 365 days but there is no benchmark for the timing used to dry the wood for the use of smoking or grilling. Some suppliers will use moisture levels of 20-30% as their benchmark but 10% is a large variable in moisture when it comes to wood. I won’t lie to you – there are a lot of choices out there for wood. How do you go about selecting from the limited information on the packaging? Some decisions you’ll have to make on your own: do you want to cook with bark or do you find that bark indeed fluctuates the temperature of your equipment too much? Do you want to use a kiln-dried product even if you don’t know what temperature and for how long that product was heated? Would you want to use a product that hasn’t had any heat application applied to it meaning there may be pests, larvae, mold, and spores that haven’t been eliminated by a heat process? Do you want to use a product from a supplier that provides no information on the moisture of the wood? Do you want to go with a “natural”, “air dried” product that may have been exposed to anything that could access the wood: animal feces and urine, insects, chemical contaminants from the ground or another source? In the end, I think the selection can be easy by simply looking at the wood for purity and cleanliness, looking at the packaging for evidence of air exchange meaning its likely not completely dried out and looking at the packaging information for claims that don’t seem to match the product that is packaged inside. Most of all, you should be able to gain valuable information from any supplier’s website on the wood they are selling to you. If not, be cautious that they may not know anything about the manufacturing process of the wood and/or what is needed in wood to qualify it as cooking ingredient. We hope that our discussion of smoking & Grilling Wood Selling Terms adds clarity to your selection process.